Warm milk, sugar, and a little coffee mixed together is a definition of bliss. In the afternoon, when you are flagging at your desk, a visit to Starbucks keeps you going in a dreamlike state so your day goes faster. When the first Starbucks arrived in the Atlanta airport, I was elated. Finally, a way to get decent coffee on my travels! I was living in Athens, GA at the time and while Athens has great cafes - the airport was a sad situation. Before I had kids, I worked in an office that sat on top of a Starbucks. I could get down to the store, and back up to my cubicle in record time. I bought latte after latte without thinking about the calorie content or the negative impact of all those paper cups. Since then, my attitude toward Starbucks has changed. 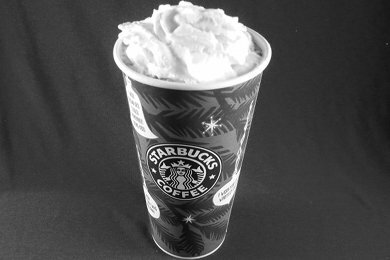 This is a photo of a Venti White Hot Chocolate. It has 2% milk and whipped cream and a whopping 23g of Fat, and 77 grams of sugar. If I had ordered the Tall with no whipped cream and non-fat milk, I'm still looking at drinking 270 calories. This is not a small snack. These special drinks have a very wonderful mixture of sweet, fatty, and salty. Their taste and texture is very hard to resist. See my post here on addictive junk food: Would you Like To Add Some Heroin To Your Order?. When you are faced with the "afternoon-blues" what should you do? How about just plain Coffee? With a little milk and sugar, you won't hurt yourself. What do YOU order at Starbucks? Please share! What is the First Piece of Advice Doctors give Dieters? Great post. May be a good resolution for people to go plain coffee or tea (maybe with a little agave or even a packet of sugar) and lowfat milk. Instead of giving up coffee maybe just tone it down. Love the blog. I order nonfat lattes (just milk and espresso). The size depends on how much I want on any given day. If I really want something sweet, I'll order a short. They're not listed on the menu but are usually available. They're only 8 ounces compared to the tall's 12 ounces. Helps to cut calories and still enjoy my favorites. i cant handle sugar in the morning at all. i use soymilk, which usually has a less processed sweetener already in it, with a little vanilla extract. u can make your own almond milk with 1 cup of almonds in a blender, slowly add 4 cups water and strain. it tastes better than any fancy creamer. dont forget about fairtrade coffee, please. the people who pick beans for starbucks do not make a living wage, folks. tea and lemon is always great, too. once you get used to the taste of food without sugar, you wont crave it anymore! I get a Cafe Americana, with Cinnamon Dolce Syrup added. It is just espresso with hot water. 15 calories for a grande. I can then control the cream and sugar. YUM! I may order a Cappuccino without whipped cream, made with skim milk. I love the froth on top. According to the website, a tall order is somewhere around 60 to 120 calories delending on the milk used. Also, I have found out that I don't need to add any sugar to it. If I'm not in the mood for coffe, I may ask for a fruit and yogurt parfait, no toppings added. Have you heard about thenew "Dolce Gusto" coffee pots? The ones in which you introduce little capsules, and water, do you can make your own cappuccino, or latte macchiato, or iced tea? What is your take on those?